Our home is a reflection of the kind of person we are. Sometimes it’s austere and spartan, messy and disorganized, or simply designed for comfort. It’s a place where we can relax, be ourselves, unwind after a long day. Home is important, and that’s why of all the potential problems your home can experience, water damage is possibly the worst and definitely the most insidious. According to Allstate Insurance, water damage is one of the top reasons for homeowners to file claims. It can be due to something huge, like flooding or a burst pipe, or due to something smaller, like a leaky pipe or faulty insulation. As carpet cleaners, we’ve seen mild damage, disasters, and everything in between. 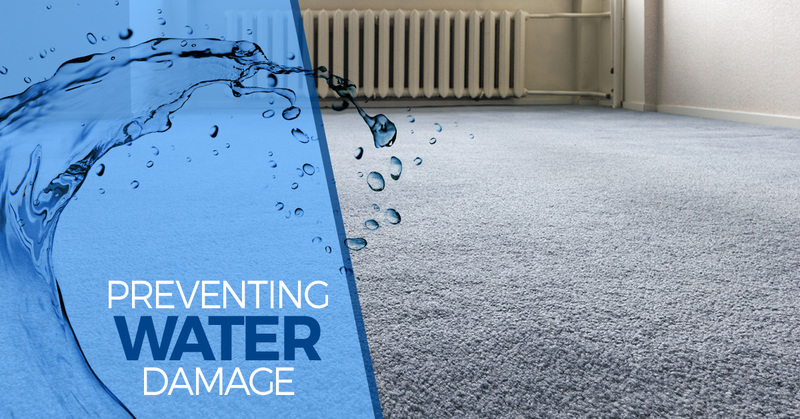 Today, we’re going to talk about a few things you can do to reduce the risk of experiencing water damage. Read on for a few helpful tips. When the temperature drops below zero, you run the risk of your water pipes freezing. The ice can expand and either weaken your pipes or cause pipes that are already weak to burst. If you know a deep freeze is coming, leave all of the faucets in your home on overnight. A small trickle will do, and the constantly moving water will prevent a freeze from taking place. Also, open all of the cabinet doors for sinks in kitchens and bathrooms. The warm air in your home will prevent the pipes directly under the sinks from getting too cold. If you have outdoor faucets for sprinklers or hot tubs, protect them during snow storms and arctic blasts with insulated covers. In fact, try not to use these faucets at all during winter. Does your home have a crawlspace? If so, make it a point to close up vents and insulate pipes. For pipe insulation, in a pinch, you can wrap them in newspaper. You can also find specialty pipe insulators at your local hardware store. For any piping that’s exposed outside, you can also wrap it in heated pipe tape. Speaking of insulating pipes, pipes that have been installed in your attic can have a nasty habit of freezing up. Be sure to close any attic windows, and make sure your pipes are wrapped securely in insulation. Usually, the average hot water tank lasts between 8-12 years. If a tank hasn’t been drained, it may not last as long. A good habit to get into is to have a yearly check-up of your hot water tank performed. If there’s nothing wrong, you just bought yourself a little peace of mind. If there’s a problem, you’re better off having repaired at a convenient time, as opposed to when it springs a leak and the outside temperature is -4 degrees. Worst case scenario, you perform all of these tips and still sustain water damage. In the event of a catastrophe, call a professional water damage clean up company immediately. We’ve been in business long enough to know that extensive water damage in a home can weaken drywall and wood, as well as provide a superb breeding ground for mold and mildew. If you’ve got questions, concerns, or you’d like to schedule a service appointment, contact us today!